I started 2018 by making a big pot of baked beans. We’ve totally over indulged the last few weeks so I’m craving proper healthy food again. No diets or deprivation, just loads of low-stress, home cooked meals – heavy on the veg and beans with plenty of fish and small servings of well-bred meat. You can see the other meals we’re eating this week here. Recipes like this are fab because they’re easy and inexpensive and form the base of lots of different meals. 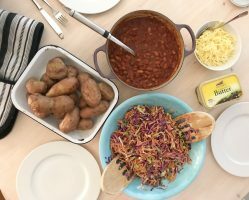 Tonight we’ll have the baked beans with baked potatoes and slaw made from red cabbage, carrot and Brussels, finely shredded and dressed with plain yoghurt, Dijon mustard and red wine vinegar. We might top them with a poached egg, crumbled cheese or some crispy halloumi. 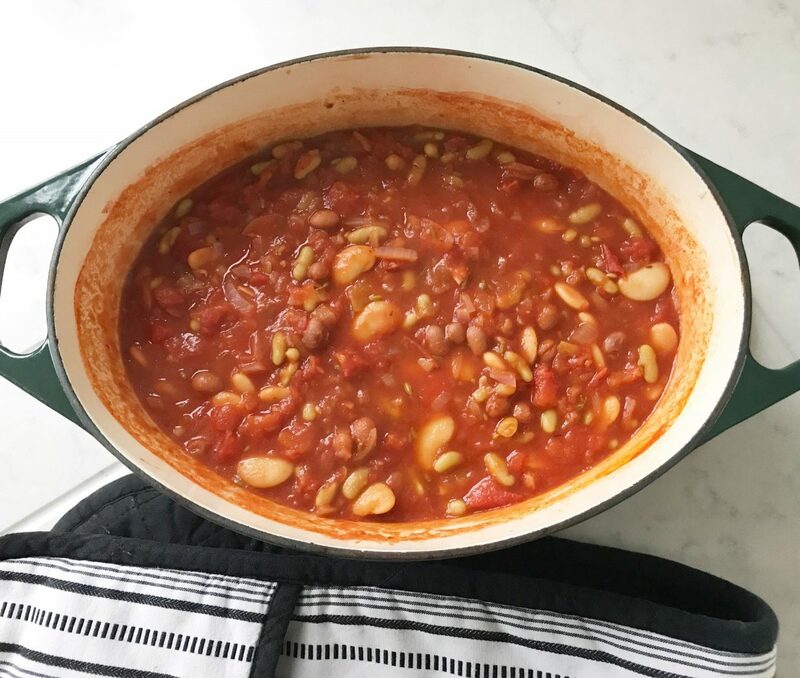 Because I make a big batch of the beans each time I make them, I always have plenty to freeze in individual servings for easy dinners in future. I’ll get these recipes written up in more detail in the coming weeks so you can make the most of your frozen stash of beans. Cassoulet – put the cooked beans in a baking dish, top with skin-on, bone in chicken thighs. Sprinkle the chicken with Herbs de Provence or dried oregano and breadcrumbs and bake until the chicken is cooked through. Stir chopped watercress or rocket (arugula) through the beans just before serving to add extra greenery. Soup – just thin the beans down with stock for a hearty soup. Swirl homemade pesto through for an extra hit of greenery and flavour. Vegetarian curry – Fry a clove of chopped garlic in a tablespoon of butter with a pinch of chili flakes and teaspoon each of garam masala and cumin seeds. Cook for a minute or two until fragrant. Stir this spice mixture into the hot beans along with baby leaf spinach. Let the spinach wilt in the heat. Serve with a wedge of lime, warm flatbread, plain yoghurt, mango chutney and chopped coriander (cilantro). 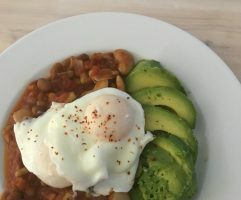 With eggs – poached eggs and avocado with the beans on toasted sourdough is a breakfast of champions. This makes enough for 4 people as a main. I usually double this so I have plenty for other meals or to freeze. 2-3 cans beans. I like to use cannellini beans (white kidney in the US), chickpeas (garbanzo in the US) or borlotti beans. You can use a mixture of your favourites. Finely dice the onions. Watch how here. Heat a teaspoon of oil in a large heavy-based saucepan then cook the onions on a medium heat, with a pinch of salt, stirring occasionally until golden and starting to soften. This will take about 8 minutes. If the onions start to catch, just add a little water and drop the heat. While the onions cook, dice the peppers. Watch how here. Add the peppers to the pan as soon as they’re chopped. Add 2 teaspoons of smoked paprika, any spices (see note above) and the tomato purée. Stir and cook for a minute then add the chopped tomatoes and drained beans. If you have a Parmesan rind, throw that in. It will impart a mellow cheesy undertone to the finished beans – think of it as a cheese tea bag! Stir and put a lid on the pan and cook for 45 minutes on a really low heat, stirring a couple of times. It should be just simmering. If you prefer, you can cook it in the oven 180°C (160°C fan) or 350°F (320°C convection) for 45-60 minutes instead. If you think you’ll be heading out, you can leave it to cook in the oven at a lower temperature for a couple of hours. Finish the beans off with sea salt, freshly ground black pepper and chili flakes to taste. Taste and adjust the seasoning until you’re happy. The really important bit is to season the cooked beans with a splash of red wine vinegar to brighten everything up. You can freeze the beans in individual portions or keep it in the fridge for 5 days. If you freeze the beans, you’ll need to season them again when you re-heat them. Find more recipes for beans, sides, and one pan meals here.